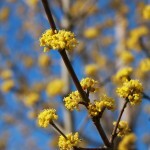 An upright, slow growing small tree that has an abundance of bright yellow flowers in the late winter and early spring. The flowers are followed by bright red, edible fruit. The foliage is glossy, dark green, changing to red in the fall. It is drought tolerant. 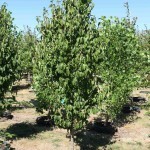 It prefers full sun to part shade in most well-drained soils.